One of the eternal truths of the fitness industry is that club owners and operators are always in search of new non-dues revenue sources. The examples that come to mind most quickly are special fee-based services—e.g., yoga, Pilates, barre, personal and small-group training, racquet sports, spa treatments, aquatic offerings, youth programming, and food and beverage. One possibility that often falls to the bottom of the list, and that’s rarely discussed or written about, is retail—the marketing and sale of tangible merchandise. The appeal of retail is made clear by the solid profit margins it produces. According to the 2017 IHRSA Profiles of Success, the “Pro-Shop/Retail” category yields a median margin of 16.5% for all clubs; 15.5% for multipurpose clubs; and 20% for fitness-only clubs. For facilities that are part of a chain or multi-club group, the figure is 22.6%; and for independent clubs it’s 12.7%. Nothing to sneeze at or overlook. Years ago, retail generally meant an on-site pro shop, especially in facilities best known for their racquet sports. Now, however, in this era of boutiques, “activewear,” e-commerce, and clubs and equipment companies dispensing their wares in major department stores a question arises: Are we talking about something different? 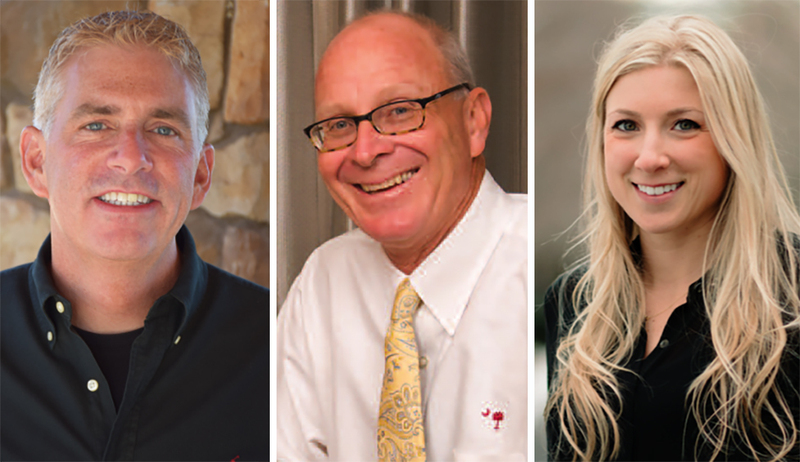 To find out, CBI tapped three IHRSA members who clearly qualify as retail authorities. The following consists of excerpts from a “roundtable” discussion to which they generously contributed their expertise. From left, Bill McBride, Kevin McHugh, and Jillian Leo. Bill McBride is a co-founder and the president and CEO of Active Wellness, a San Francisco-based club management company that owns and operates three clubs in the Bay Area, each of which has a retail component, and manages 52 other facilities. He’s also the CEO of BMC3 Consulting, and a former chairperson on IHRSA’s board of directors. Kevin McHugh is the COO of The Atlantic Club, a sprawling multipurpose facility in Manasquan, N.J., which operates a second, smaller club in nearby Red Bank. The 675-square-foot boutique shop in its Manasquan location generates a net profit of approximately $90,000 a year. Jillian Leo, based in New York City, served, until recently, as the director of retail operations for all 30 of Crunch Fitness’ company-owned facilities. She now oversees the retail arm of Blink Fitness, which owns and operates nearly 80 locations in five states. Are retail and health clubs a good match? What are the most popular retail offerings these days? Kevin McHugh: Whether or not retail works depends on the type of club. At some, members are “in and out” for a workout and aren’t likely to stop and shop. Our members enjoy browsing to relax, and eventually they become buyers. Shopping becomes part of the total member experience. They have the time to enjoy the benefits of a one-stop, multipurpose facility that, in addition to a wide variety of amenities, also offers retail. In our case, nicely displayed, fairly priced boutique products are most popular. Bill McBride: Some clubs have been very successful with nutraceuticals—supplements, meal replacements, and smoothies. Strong apparel brands also are getting good traction. If clubs don’t have a shop, it may be because traditional retail involves managing inventory. For operators who aren’t really retailers, having a shop has often involved an administrative burden and product “shrinkage”—lost inventory—often for what’s proven to be a relatively small revenue stream. Jillian Leo: To some extent, despite all of the new options, we’re still talking about a pro shop. But the industry is exploding with new products—from natural drinks and bars to vibrating foam rollers. Clubs with retail space have the chance to be among the first to sell some of these new and unique items. Those that offer personal training also can profit by offering a line of supplements. Trainers typically are well-informed in this area, and some supplement companies provide guidance to assist with selling. What about retail and small independent clubs? BM: A retail strategy makes sense for all clubs. The key is to decide on the scope of what you want to do based on your club’s capabilities. KM: I suggest that you test the market and try a variety of approaches. You may just want to provide a few essentials. Or you might want to have the kind of shop that allows members to pick up a gift for a friend, without having to stop elsewhere. Start small and grow as it seems appropriate. JL: If you can’t have a robust retail footprint, what you do offer should be meaningful. Also, branded apparel and small accessories can be a great marketing tool, creating valuable brand awareness. What percentage of total revenue can clubs reasonably expect retail to provide? BM: That’s a difficult question. I have one client who does $1.5 million a year in meal replacements and nutraceuticals. It’s a major component of their comprehensive weight management program, which involves group meetings, health coaching, etc. But, for a typical club, 1%-3% of total revenues from retail isn’t unusual. Ideally, I’d like to see it grow to a bit more than 5%. JL: The answer depends on what type of other non-dues revenue a club is producing, but I think 8%-10% would be reasonable. What can clubs do to maximize the retail opportunity? BM: Think “airport pricing.” Chose a product line with a high margin, such as water, and mark up for the convenience you’re providing. Also, think about the “end-caps” at grocery stores and impulse buys at the checkout counter—do something similar. Make the bars available for easy purchase and do some sampling. People may be reluctant to pay $3 for something they might not like, so feature a different bar every day; cut the bar into small pieces, and set them on a nice platter with a toothpick in each. Display an ingredients sheet including the price of the bar. KM: To determine your product mix, listen to your members. Ask what products they’re looking for, and then keep an eye on what actually sells. Fitness clothing may be essential, but it’s not necessarily the most profitable offering. Unique gifts, apparel, and accessories seem to be the hot items. For example, each fall, our club sells a pumpkin candle that members can only buy from us—it brings customers into the store year after year. To drive sales, advertise in your newsletter and do lobby displays. Your fitness instructors can wear or mention different items featured in your store during their classes—for instance, a yoga teacher could endorse a high-quality mat that’s sold in your shop. And, don’t forget, your most satisfied buyers will spread the word. JL: The most popular items will always be the basics—things like drinks, bars, and small accessories, such as locks, socks, and supplements. People are always going to forget their locks, and there’s no need to ever mark them down! I agree with Kevin that tying a product to a class or event is a great way to boost sales. Which brands are the most successful in a club environment? BM: I very much like what some of the fitness boutiques are doing with apparel and accessories. SoulCycle and Peloton both have brand affinity that they’re leveraging in a big way. KM: Men like Under Armour for fitness wear, and women like soft, comfortable workout/leisure wear. To be successful, clubs should feature brands that can’t be found in local stores. 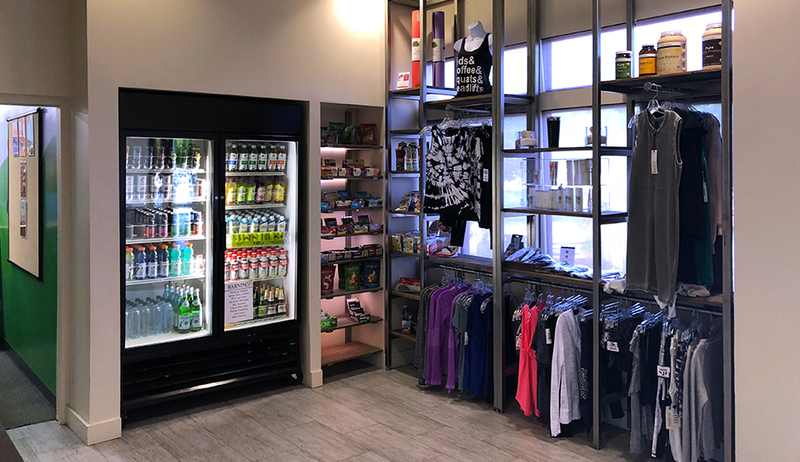 A variety of items are featured at the Forma Gym in Walnut Creek, CA. Over the past decade, e-commerce has disrupted retail dramatically. What does it portend for clubs? BM: It can be a big opportunity. Every club, I think, should have an online store with apparel, equipment, meal replacements, and nutraceuticals. Our site offers an assortment of branded products. Most clubs have been slow to respond, but in their defense, they have to weigh a host of factors—procurement, inventory, storage, inventory management, logistics, SKU entry/management, and staff training—against the likely ROI. But if they have 2,500 to 5,000 members—that’s a serious pool of potential customers. One of my high-end clients sells apparel at cost to expand his brand. He considers it a marketing expense. KM: Yes, online shopping has affected everyone. Still, in the case of in-club retail, we know our customers and can give them individual attention. That’s something they’ll never get online. Many members still prefer the small-business experience; you can capture this audience. BM: Yes. As I mentioned, we have a site. KM: It’s something we’ve considered, but staffing it to efficiently implement orders and handle the fulfillment and shipping just doesn’t make sense at this time. JL: We used to have one, but it wasn’t very profitable for us. Tell us a bit more, if you would, about your retail operations. BM: We’ve found that there’s a natural tie-in with weight loss, weight management, and health coaching programs. And, with nutraceuticals, there’s a solid personal training connection. I think there’s also a big opportunity for “souvenir” types of products—special hats, shirts, jackets, etc.—that are based on events at the club. I recently paid $150 for a $95-$115 bottle of bourbon at the Kentucky Derby, because it was a commemorative bottle. Clubs can do the same on anniversaries and special events. KM: Our boutique-style shop has, over the years, changed from concentrating on workout clothing to introducing a lot of new items. Unique merchandise and attractive displays are our biggest lures. We also sell pool accessories, yoga mats, and many items related to the different activities offered at our clubs—for instance, suntan lotion and camp supplies in the summer. If a member is paying for or participating in a club event or challenge, it’s generally assumed that they’ll receive some swag. Most of that is handled by our fitness or marketing departments. JL: We carry dotFit supplements that tie back to our personal trainers. The trainers are thoroughly educated on the product and are able to recommend the items that are best for their clients. We carry HyperIce products, which we use in our SweatShed small-group training classes, which allows members to try them before buying. And we also sell club logo merchandise year-round. Do you offer any “must-have” or “I forgot” items? Planet Fitness offers items for sale at the front desk. KM: Headphones, socks, and swim goggles are the biggest sellers. JL: Locks, socks, headphones, and, believe it or not, men’s shorts. We find men tend to be a little more forgetful! Who oversees the operation, and what sort of special expertise is required? BM: In most cases, the front/service desk manager oversees retail. If a club has a café, then two departments are involved. KM: The store manager does the buying, hiring, and displays, and makes the overall pricing and sale decisions with my assistance and that of the accounting department. We address any challenges that arise with enthusiasm and positive thinking. Our main purpose is to please the shopper. JL: At Crunch, I oversaw the entire retail department for all 30 of our corporately owned clubs, and the general or operations manager at each club managed their respective spaces. The biggest challenge was not having a dedicated retail person in the clubs to focus on merchandising, inventory, and restocking. While staff can do a great job, they have many other responsibilities. Some clubs manage retail within their member services system. However, because of the intricacies involved in inventory and purchase orders, others have moved to a true retail point-of-sale system to function like a true retail shop. And the future? Is anything new in the works? BM: We’re going to do more training and implementation to drive impulse purchasing. KM: No, not at this time. We’re doing quite well with what we have. JL: Everyone knows that Crunch is often the first to offer certain types of group fitness classes, and that often carries over to retail. There’s always the next new trend! Tighten up your gym's sales strategy with these six steps from Jeff Houghtaling, membership director for VillaSport Athletic Club and Spa.